During the early 1920’s, three Cleveland, Ohio physicians established Riomar as a private winter resort for themselves and their families. The facilities included a clubhouse and guest cottage on what is now Riomar Drive, a nine-hole golf course and a beach house. This building on Club Drive was the second clubhouse. It was built c. 1929, and is one of Vero Beach’s oldest permanent structures on the barrier island between the Indian River and the Atlantic Ocean. Its Mediterranean Revival style with a stucco exterior and perky cypress interior was popular in Florida during the 1920’s land boom. A center for the area’s social activities, Riomar attracted many permanent residents and winter visitors to Vero Beach. In 1965 the c. 1929 clubhouse and guest cottages were purchased by Saint Edward’s School, an Episcopal day school with 33 students, grades 5 through 8. In 1972 an Upper School campus was opened on A-1-A south of here. The clubhouse continued as Saint Edward’s Lower School and now houses pre-kindergarten through grade 6. The building was renovated in 1988, but maintains its original character. Location. Marker has been reported missing. It was located near 27° 38.46′ N, 80° 21.392′ W. Marker was in Vero Beach, Florida, in Indian River County. Marker was at the intersection of Club Drive and Old Oak Lane, on the left when traveling north on Club Drive. Touch for map. Former location of the school and marker is now a development of 10 homes. Marker was at or near this postal address: 2225 Club Drive, Vero Beach FL 32963, United States of America. Touch for directions. Other nearby markers. At least 8 other markers are within 3 miles of this location, measured as the crow flies. Veterans Memorial Island Sanctuary (approx. 0.9 miles away); Bethel Creek House of Refuge (approx. 1.7 miles away); Vero Beach City Hall (approx. 2.4 miles away); Vero Beach Railway Station (approx. 2.6 miles away); City of Vero Beach (approx. 2.7 miles away); McKee Jungle Gardens (approx. 2.8 miles away); McKee Jungle Garden Gates (approx. 2.8 miles away); Osceola Park Historic Residential District (approx. 3 miles away). Touch for a list and map of all markers in Vero Beach. Regarding Riomar Clubhouse Saint Edward's School. The clubhouse/school was demolished in 2013. More. 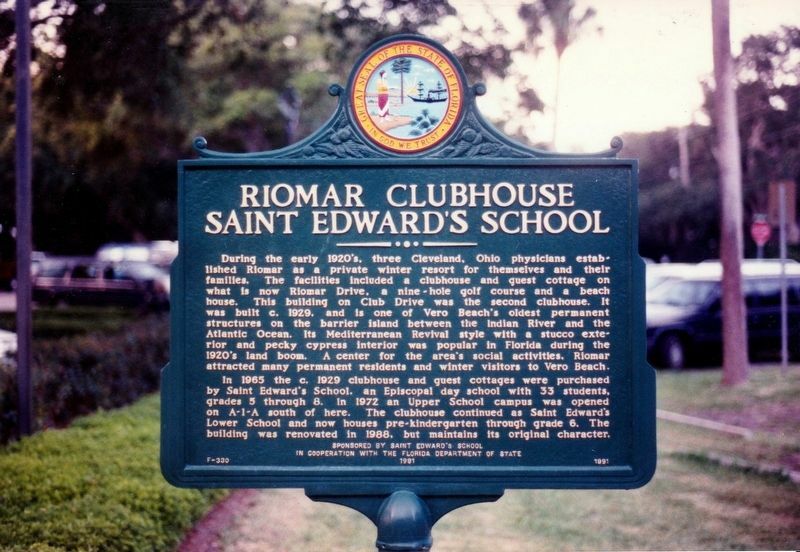 Search the internet for Riomar Clubhouse Saint Edward's School. Credits. This page was last revised on March 3, 2019. This page originally submitted on February 5, 2019, by Tim Fillmon of Webster, Florida. This page has been viewed 44 times since then. Last updated on March 3, 2019, by Tim Fillmon of Webster, Florida. Photo 1. submitted on February 5, 2019, by Tim Fillmon of Webster, Florida. • Bernard Fisher was the editor who published this page.